Fennel is to vegetables what bacon is to meat. This mild cousin of anise can be used raw in salads or cooked in stews and soups, but it only reaches sweet, glorious perfection when braised, sauteed, or fried. If you have never tried it, you are in for a treat! Cut off the stalks close to the bulb, reserving some of the feathery fronds to use as a garnish for the finished dish. Cut a thin slice off the root end and trim and discard any discolored parts of the bulb. Slice vertically into 3/8-inch slices. Rinse the slices well with cold water and drain. Place in a large skillet and add olive oil and water. Place over medium heat and cover pan. Cook, turning slices over occasionally, for about 20 minutes or until tender. Add more water if necessary. (The fresher the fennel, the faster it will cook.) When the fennel is tender, uncover the pan. Turn the heat up and continue to cook until all the water is absorbed and the slices are deep golden brown, turning to brown evenly on both sides. Sprinkle with salt and pepper and top with Parmesan. Serve hot. 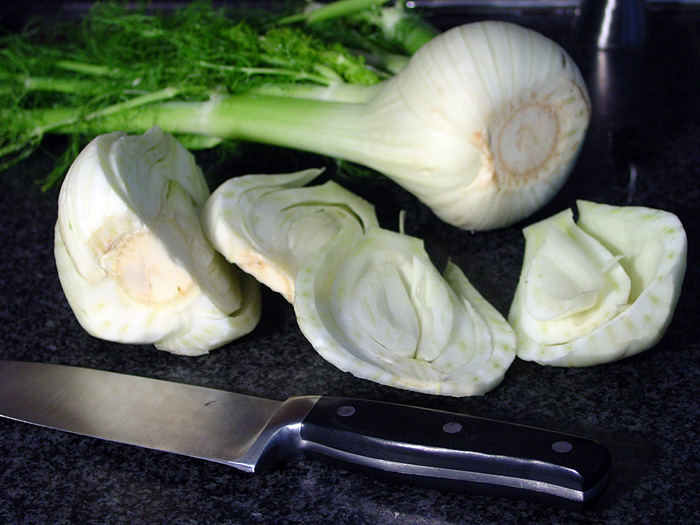 Finocchio, or Florence fennel, has a bulbous base that is used as a vegetable. Fennel seeds that are used as a spice come from common fennel, which has no bulb. Fennel pollen, called “spice of the angels,” is also used as a spice. The fern-like greens of either plant can be used as an herb. I used candied fennel as a dessert topping in one of the recipes in Nourished. About Fennel., Braised Fennel, Parmesan. Bookmark. I've never eaten the bulb. Does it have any of the licorice-like flavor of common fennel seeds and anise seeds? Nice posts here is given.i like all post here is given so keep it up.